Despite the daunting weather, demonstrators from a wide variety of groups - or no group at all - gathered together on Hyde Park for our giant overhead photo. Tony Black and David du Preez and their team had been plotting this out since 8.00 am in the morning and all the effort paid off nicely as you can see! Before the photo there had been a Climate Service at the Church of the Annunciation, Bryanston Street, organised by Christian Ecology Link (see here) and a protest cycle ride that had set off from Lincoln's Inn Fields at 10.30. 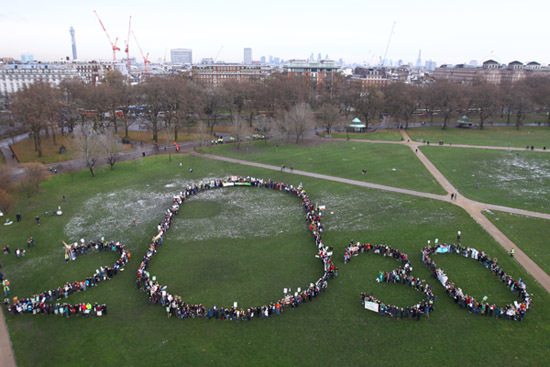 Next, everyone took the message to parliament with many placards and banners twinning the 'zero carbon by 2030' message with one calling for 'a million climate jobs'. Marching off via Park Lane, Piccadilly, Lower Regent Street, Trafalgar Square and Whitehall to finally hear the sound of 'Seize the Day' playing at the end of Abingdon Street, right in the shadow of the southern tower of the Houses of Parliament. Here, campaign coordinator Phil Thornhill kicked off an impressive list of speakers: Caroline Lucas MP (Britain's first Green MP and leader of the Green Party), Michael Meacher MP (veteran environmental champion in the Labour Party), John McDonnell MP (Labour MP for Hayes and Harlington who thanked the climate movement for helping him in his battle against the devastation that would have been caused by a third Heathrow runway ), Andy Atkins (Director of Friends of the Earth), Tony Kearns (long term climate campaigner as well as Communication Workers Union Gen Sec), Maria Souviron (ambassador from Bolivia the country leading the charge for developing countries demanding climate justice at the UN talks ), Paul Allen (pioneer of the zerocarbon Britain 2030 project from the Centre for Alternative Technology), Ben Brangwyn (co-founder of Transition Towns), Sophie Allain (from Climate Camp and spokesperson for the Ratcliffe 20 Direct Action activists), Maryla Hart (from Biofuelwatch) and John Stewart (chair of AirportWatch and HACAN) to round off the speeches with the reminder that 'we have the answers' and around the globe our movement is building. YouTube clips of the speakers are up here. Musical interludes were provided by Seize the Day and Climate Justice All-Stars, while welcome refreshments were served by the Brixton Tea Party. Finally many demonstrators retired to a convivial 'after-party' at the Enterprise pub in Holborn. 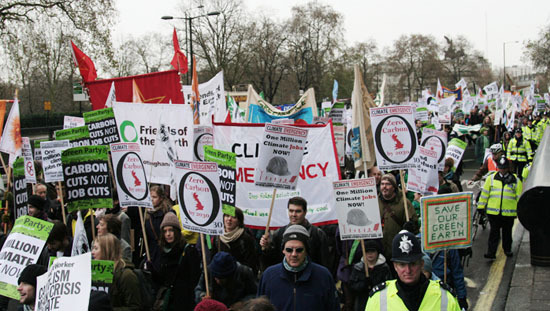 The Climate March happened despite the freakish wintry weather (although it got a little milder on the day): see here and here how this cold winter weather is linked to climate change.